There was another rally at the Capitol last night, timed to commemorate the death of Dr. Martin Luther King, Jr. and to rock the vote for today's election. Using my shiny new press pass got me riiiight up front for a change. 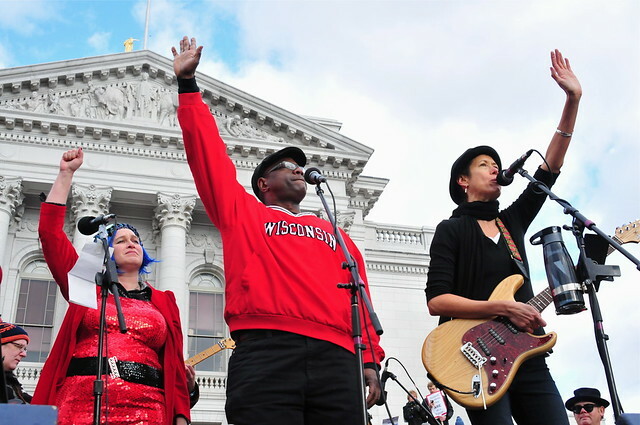 That was pretty cool as Michelle Shocked flew back to Madison and rocked the crowd joining Madison's own VO5. VO5 has been in the front lines of the protests, so this was a nice feather in their cap. When Shocked noticed the Madison Fire Department's pipe band waiting their turn on stage, she called a bunch of them up (the stage got pretty crowded) and the three groups managed to rapidly find a key they could all play in and blew the crowd's mind. The turnout was pretty good. I have not seen an official estimate, but I will call it at somewhere between 2-3,000. 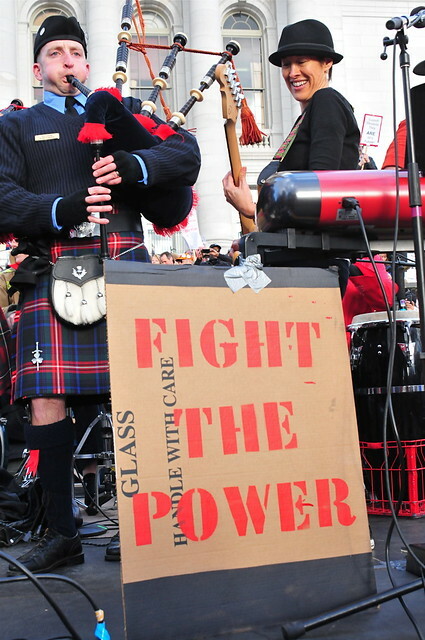 Indeed, there are many ways to fight the power! 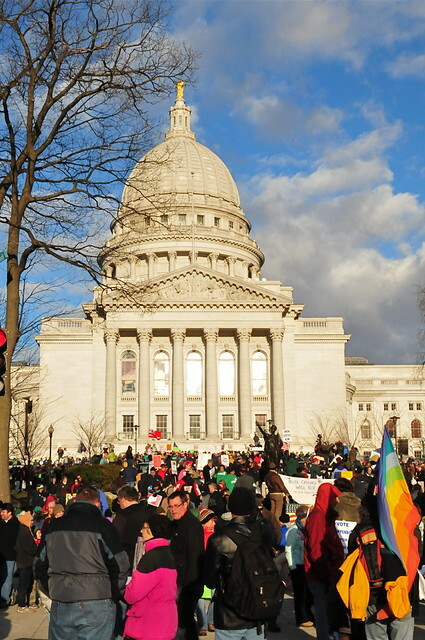 Music, poetry, compelling speech, marching around the square, photos, videos, being present and counted, or simply driving around the square while running errands honking your horn to the rhythm of "This is what Democracy looks like!" But the best way of all is to get out and VOTE. There are another 20 or so pics from yesterday in a SLIDE SHOW. The show contains protest photos all the way back to Feb. 15, but the most recent ones are up front. Enjoy.